Good Vibrations is a small but, internationally-respected charity, working in the UK. We use communal music-making to support people with complex needs in challenging settings to develop transferable life and work skills. 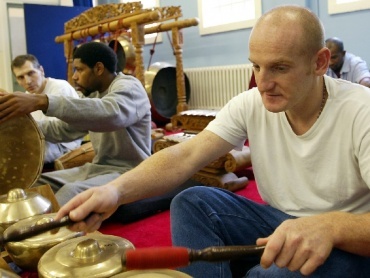 We are most well-known for our use of gamelan music in prisons. We have partnered with 99 prisons, YOIs, immigration removal centres, mental-health hospitals, and community partners since 2003 to support 8000 participants, and there is a significant body of independent academic research on our work. To find out more, visit the rest of our website (www.good-vibrations.org.uk). We are looking to recruit a part-time Grants and Trusts Fundraiser. This will initially be on a one-year contract, but we hope to make this a permanent position. We can offer a great deal of flexibility in terms of where the post-holder works, and the hours they work to make up their 0.6 FTE contract. To apply, candidates must email their CV, and a covering letter explaining how they meet the person specification to Good Vibrations’ Executive Director, Katy Haigh by Wednesday 13th March. Here is the job description. To submit your application, please email katy@good-vibrations.org.uk. Applicants should keep Monday 25th March free to attend an interview in Central London (or by Skype) as we will be interviewing short-listed candidates that day. There will also be a written exercise. We will notify short-listed candidates with further details by Monday 18th March 2019. To support Good Vibrations’ equal opportunities monitoring, please also complete this form and email it to jane@good-vibrations.org.uk so that it can be treated anonymously, and separate to your application. Receive invites to our end of project ‘play-throughs’, by signing up for our newsletters with our Operations Manager. You’ll get them out about once every two-months, and you can unsubscribe at any time.